Samedayessay is another essay writing website that help students solve their academic needs. It offers both long-time and urgent paper help for reasonable prices. So let’s add information to same day essay reviews. The website provides a wide range of essay writing services including writing dissertation, term paper, article, case study, coursework, lab report, movie review, editing and proofreading services. A customer can overview several samples on their website to evaluate the average level of their writers. Samedayessay states they have a team of premium qualified writers who will do great job for you. They choose the top writer for a customer’s assignment according to the topic provided. Depending to the urgency and academic paper level Samedayessay prices vary from $11.30 for high school paper to almost $45 for doctoral paper. It can not be said that prices are average as there are custom writing sites the price of which starts approximately from $10.But if your essay is due to several days and you need quick assistance they are of good help for you. First of all, they provide promo codes for the first order of 15%. When you visit Samedayessay website a window pops up and you type your email for getting a special offer. Soon after you get an email with a discount coupon. To use it a customer must just log in and type the promo code number into the ordering form. It is a one time discount and further on a client becomes a member of a loyalty program that will help to save more. That is a customer will get a 5% discount for the second order of the total price. Another saving option is referring friends and earning extra cash. For a friend you get $50 and 5% discount for a customer’s order. And your friend will get 15% discount for the first purchase. While ordering an academic paper Samedayessay offers extra payment services. 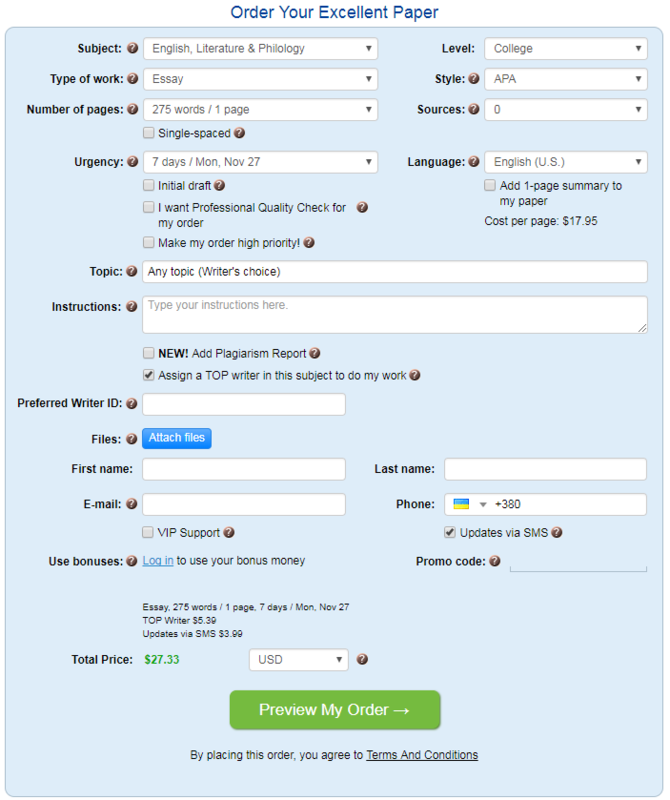 Thus, you can get plagiarism report for $14, add one page summary for $24, top writer and updates via sms cost approximately $4 both, extended revision for $1.70 and initial draft for $2.20 and other expenses are professional quality check for $7.91 and high priority for your order costs almost $10. In the end the sum becomes impressive $80.52 for one page high school level the longest urgency. So, you must be careful with your extra services. You are guaranteed secure payment via payPal so that no one will see your credit card data. The site provides free extras as free revision, title page, quality and plagiarism check and free reference page. Those extras are common with such essay writing sites. We could not find samedayessay rating but the website claims to deliver plagiarism-free papers and free revisions according to the customer’s instructions until he or she is 100% satisfied with the quality of paper. Unless, the website guarantees full money back to the client. No third person will know your personal data as your personal information is securely encrypted. Samedayessay provides 24/7 friendly customer support via live chat, phone and email. All the contacts are viewed at the top of the site. A polite agent Charlie answered all our questions concerning ordering process. Thus, they have friendly fast responsive support for their clients. All in all, the site is user-friendly, it gives all the necessary information without additional requests. They have FAQ section at the bottom of the ordering page, besides they offer reasoning and other sections to clarify some additional information. You get 15% off discount included from the start. The website is customized and easy to navigate. No claim of lateness was reported according to Samedayessay reviews. They state delivering on time but several revision cases. As the site has minimum 3 hour urgency the company must have a great number of skilled writers to provide due-to-time delivery.